It was an all-Needham final and Aaron Revzin took the South singles title. He also led the Rockets to the Division 1 team title. Meet the standout performers who earned All-Scholastic honors for their work this spring. Bader, who has a 23-3 career doubles record, advanced to the finals of the North individual state tournament with partner Dan Maffa. Bader, who helped Lexington win the Division 1 North championship in 2010, will attend Yale. Bloom played first doubles with Jake Steinberg and was 20-2. In three seasons together, the duo compiled a 60-6 record. Bloom, a three-time Hockomock League All-Star, is a four-year varsity starter and captained the team his senior season. He will attend Cornell. Chen, who was named a Dual County League All-Star, advanced to the North singles final of the individual tournament. He is ranked in the top 10 of the USTA 14-and-under New England division, and also enjoys playing basketball. Corvi and his doubles partner Ian Wright won the state championship after going 15-3 in the regular season. Corvi was also captain of the ski team and a National Honor Society member. He will attend Northeastern in the Fall. Johnson reached the semifinals of the South singles individual tournament. The sophomore, who has a 4.0 GPA, also plays in USTA tournaments and is ranked 21st in the 16-and-under New England division. Maffa, a three-time Middlesex League All-Star, advanced to the North individual state finals with doubles partner Jonah Bader. Maffa, who plays in USTA tournaments, helped his team win the Division 1 North title in 2010. Okanow and doubles partner Mitch Silverman defeated Sharon to win the South individual championship. For the second straight season, Okanow helped the Rockets capture the Division 1 state championship. The National Honor Society student also coaches a Special Olympics basketball team. The senior captain finished 15-2 in first singles and advanced to the semifinals of the North individual tournament. Piotti played first singles all four years and will attend Georgia Tech. The honor roll student is also a three-time Middlesex League All-Star. 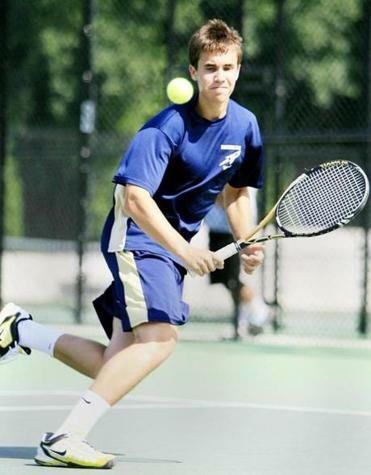 Pronchick, who was named a Middlesex League All-Star, won the North singles individual state championship. In four years, he has a 53-9 singles record. Also a varsity golfer, Pronchick will attend Colgate University. Revzin won the South individual singles tournament against teammate Aaron Segel, and helped the Rockets win their second straight Division 1 State championship. The National Honor Society student, who won four South individual championships, will attend Amherst College. Segel finished his senior season undefeated in second singles, and lost to teammate Aaron Revzin in the South finals. The two-time captain led his team to Division 1 state championship and is 70-4 in four seasons. He will play tennis at Trinity College. Silverman and doubles partner Ben Okanow won the South individual tournament, as Needham went on to win the Division 1 state championship. Silverman, who also enjoys playing the guitar, will attend the University of Denver. Steinberg and doubles partner Eric Bloom finished the season 20-2 before losing in the South individual final to Needham. Steinberg also helped Sharon capture the Division 2 South championship. The three-time Hockomock League All-Star will captain the soccer and indoor track teams next year. Toner was 19-3 in second singles during the season and advanced to the semifinals of the North individual tournament. He also helped the Eagles to the Division 1 North finals. As a sophomore, he was undefeated in third singles. Wright and doubles partner Mark Corvi won the doubles individual state championship, defeating Needham's duo of Ben Okonow and Mitch Silverman. The pair was 15-2 in the regular season. Wright is also an honor roll student. In his first season with the Seahawks, Wyeth was 17-0 in first singles matches and advanced to the semifinals of the South individual tournament. Wyeth, who also plays soccer and AAU baseball, aspires to play at Harvard or Stanford. The 11-year coach helped Westport to a 20-1 record this season and a trip to the South Division 3 semifinals. Clark has amassed a 136-56 career record and has lead his team to the playoffs every season but his first in 2002. Cunniff led Bridgewater-Raynham to an 18-3 record and a trip to the Division 1 South semifinals. In five years, Cunniff has a 52-29 tennis coaching record and he was previously named a Coach of the Year in basketball. In his 22nd season as head coach, Powers led the Warriors to a 19-2 record and captured his fourth Division 2 state championship. Powers, who often accompanies the team on long runs, attributes their success to the "grueling fitness regimen" he puts them through. Atlantic Coast — Falmouth: Sean Dugas, Brett Folger, Richard Moore, Spencer Pinkney. Marshfield: Gerard Tierney. Nauset: Nick Majewski. Plymouth North: Matt Doherty, Cam Evans, Sean Folan, Jack Murphy. Plymouth South: Sam Cheung, Jeff Tocco. Sandwich: Matt Martin. Bay State — Brookline: Alexander Johnson. Needham: Ben Okonow, Aaron Revzin, Aaron Segel, Mitchell Silverman. Big Three — Brockton: Cara Bosco, Andrew Cooper, David Guzman, Jacob Guzman, Michael Mathieu, Michael Rivera, Andres Sanin. Durfee: Man Kit Chow. New Bedford: Damien Montague. Catholic Central — Arlington Catholic: Allen Judd. Austin Prep: Jason Carrier, Trevor Cox, Kevin O'Toole, Brad Rivotto, Stratton Stilianos. Bishop Fenwick: Jorge Mutti. Cardinal Spellman: Dan O'Malley, T.J. Wells. Lowell Catholic: Kenneth Pham, Junsup Shin, Jared Steele. St. Mary’s: Pat Barceleau, Dennis Bertocchi, Chris Blaise, Grant McKinnon. Catholic Conference — St. John’s Prep: Mark Corvi, Christopher Toner, Ian Wright. Dual County — Acton-Boxborough: Kevin Doherty, Rauhul Kulkaami, Kevin LaFrancais. Boston Latin: Rohny Rosario, Jordan Talbert. Concord-Carlisle: George Cohen, Matt Japko, Thomas Kleyn. Wayland: Ethan Hecker, Will Sharton. Westford: Kamison Bigham, Victor Braescu, Cory Yu. Weston: Ethan Chen, Max Legocki, Trevor Sands. Eastern Athletic — Bishop Feehan: Matt Boland, Matt Ustas. Coyle & Cassidy: Kevin Dupont. Somerset Berkley: Aaron Makhijani. EIL — Beaver Country Day: Kris Bronner, Hunter Flint, Jon Marsh, TJ Moor, Jay Rodman. Pingree: Sam Cregg, Joseph Knowles, Joshua Linton, Hayden Steward. Greater Boston — Cambridge: Kyle Alpert, Byron Cohen, Mehmet Ozvar, Jeremy Sternbach, Henry Tittmann. Latin Academy: Saiful Mahmood, Gar Paul, Jimmy Ye. Medford: Steve Lee, Kevin Nguyen. Hockomock — Attleboro: Matt Forrest, Brittney Kisamore. Foxborough: Tyler Aubuchon, Aidan Hyland. Franklin: Jonathon Hardesty. King Philip: Jon Marinelli, Mike McCarthy, Ian Pimental. Mansfield: Krish Bandi. North Attleborough: Colin Sexton. Sharon: Eric Bloom, Peter Hu, Vivek Nangia, Jake Steinberg. ISL — Belmont Hill: Nick Cary, Carl Reid. BB&N: Jesse Karol. Groton: Tyler Phelan. Middlesex: Peter Beatty, Jon Sokolsky. Nobles: Cam Chapman, Cam Smith. Roxbury Latin: Cameron Ferguson, Jarad Gough, Joey Haig. St. George’s: Stathi Kynakides. St. Sebastian’s: Weston Brach, Connor Haughey, Conor Haughey. Mayflower — Bishop Connolly: Conrad Calcagno. Sacred Heart: Cam Keough. West Bridgewater: Derrick Brown. Westport: Dan Chouniard, Rich Hartnett, Lyle Rosa, Nick Rossa. Middlesex (Large) — Belmont: Chris Gortmaker. Lexington: Jonah Bader, Dan Maffa, Harry Nichols, Mark Pronchick. Reading: Tyler Bova, Drew Mignosa, Jarid Polley, Alec Tzianabos. Winchester: Dan Boulanger, Jake Criss, Ryan Ludwig, Nick McIntyre, Erik Meiler, Matt Roll. Middlesex (Small) — Burlington: Scott Barrett, Dean Boodakian, Cam Frank, Brian O'Connell, Joe Piotti, Christian Repunte, Derek Skinner. Melrose: Tim Mongeau. Stoneham: Bradley Fagan, Andrew Maganzini. Wakefield: Dylan Sellers. Watertown: Jake Hellman, Anthony Kapotsis, James Kapotsis. NEPSAC — Cambridge Weston: Sam Hoenig, Isaiah Krieger. Cape Cod Academy: Patrick Wyeth. Concord (N.H.): Creighton Foulkes. Gann Academy: Ilan Belkind, Carl Haber, Oshri Olsberg. Newman Prep: Alvaro de Castro. Old Colony — Barnstable: Sonny Bisazza, Cooper Blaze, Donnie Brodd, Aaron Kanzer, Gabe Rourke, Tyler Shibles. Bridgewater-Raynham: Andrew Do, Owen O'Connor, Pat O'Connor, Shane O'Connor, Kyle Rego. Dartmouth: Andy Burdick, Sheamus McNamara, Mike Mello. Taunton: Matthew Bileau. South Coast — Martha's Vineyard: Kent Leonard, Jackson McBride, Patrick McCarthy, Ryan Sawyer, Nathaniel Schneider, Connor Smith, Justice Yennie.